and associated methane in the Raton Basin derive from the late Cretaceous Vermejo and Raton formations, which overlie the Trinidad Sandstone, a basinwide marine sandstone (Figure 2.6). The Vermejo Formation was deposited as a collection of channel, lagoon, coastal swamp and delta plain deposits and the Raton Formation was deposited on a continental alluvial plain as a collection of channel, overbank, and swamp deposits. Numerous thin coalbeds in the Vermejo and Raton formations cannot be correlated over more than a few miles (Haley, 2004). Magmatic intrusions into the sediments also disrupt the sedimentary rock succession, including the coals. As with the other CBM basins in the West, water quality as a function of TDS varies widely across the basin, ranging from 900 to 3,500 ppm TDS on the western side of the basin, to 15,000 to 30,000 ppm TDS closer to the eastern outcrop. The Piceance Basin is located in the northwest corner of Colorado (see Figure 2.7a). Commercially recoverable amounts of methane occur in the Upper Cretaceous Mesaverde Group, which covers about 7,225 square miles of the basin. The Mesaverde Group ranges in thickness from about 2,000 feet on the west to about 6,500 feet on the east side of the basin (Johnson, 1989). Depth to the methane-bearing Cameo-Wheeler-Fairfield coal zone is about 6,000 feet, making methane extraction somewhat more technically challenging than in other areas where the formations are shallower (Figure 2.7b). In general, potable water wells in the Piceance Basin extend a few hundred feet below the ground surface, vertically a mile from the methane-producing zone. Below a depth of about 200 feet, the salinity of produced water can be as much as half the salt concentration of seawater (EPA, 2004). The Uinta Basin of east-central Utah and northwestern Colorado covers approximately 14,400 square miles and is similar in its composition and history to the Piceance Basin. The Uinta Basin is separated structurally from the Piceance Basin near the Utah and Colorado border (Figure 2.7a). Similar to the Piceance Basin, coal occurs in the Cretaceous Mancos Shale and the overlying Mesaverde Group at depths of about 1,000 to over 7,000 feet below ground surface (Garrison et al., 1997). Coals from which CBM can be commercially recovered occur 4,200 to 4,400 feet below the surface (Gloyn and Sommer, 1993). Coalbeds are present within Cretaceous sedimentary rocks throughout much of the Uinta Basin. However, CBM exploration has targeted coalbeds in a sandstone member within the Mancos Shale and coalbeds in the Mesaverde Group. The sandstone in the Mancos shale was deposited in a fluvial-deltaic environment. The coalbeds in the Mesaverde Group consist of coal interbedded with sandstone and a combination of shale and siltstone. 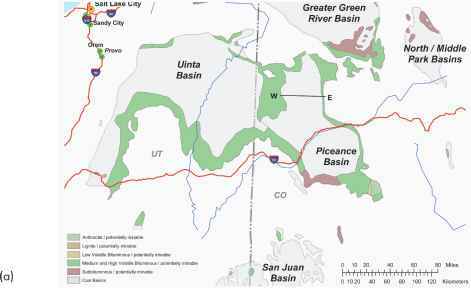 As with the Piceance Basin, water quality associated with the Uinta Basin CBM can be very saline, and salinity of produced water may be as much as that of seawater. FIGURE 2.7 (a) Geological map of the Piceance and Uinta basins. Cross-section for the Piceance Basin in Figure 2.8b is identified. (b) Generalized west-east geological cross section across the Piceance Basin of Colorado. The CBM is found in the Mesaverde Group. Fm = Formation. SOURCES: (a) ALL Consulting (2003); (b) RMAG Special Publication by Yurewicz, D.A., et al. Copyright 2003 by Rocky Mountain Association of Geologists. Reproduced with permission of Rocky Mountain Association of Geologists. The Powder River and San Juan basins have seen the most CBM development, followed by the Raton Basin, as illustrated by the number of wells operating in each basin (Table 2.1). The Piceance and Uinta basins have seen significantly less CBM development. Water and gas production curves from the Powder River, San Juan, Piceance, and Raton basins illustrate variations in CBM produced water volumes. These variations illustrate the difficulty in predicting water and gas production volumes for a basin through time due to interplay of natural hydrogeological characteristics of the basins, the number of existing and new wells, and operator pumping rates. Relatively high water-to-gas ratio in 2006 does not reflect long-term CBM production trends in the Piceance Basin. Refer to Figure 2.8d. 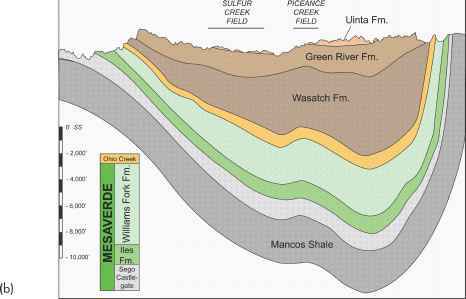 SOURCES: Powder River Basin data adapted from Meredith et al. 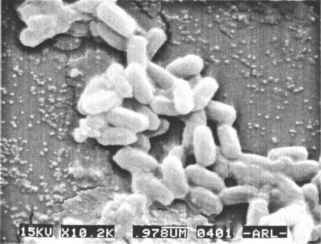 (2010); wogcc.state.wy.us (accessed March 5, 2010); and C.D. Frost, presentation to the committee, June 2, 2009. Raton Basin data adapted from Hemborg (1 998); Topper (2009); and M. Fesmire, presentation to the committee, June 2, 2009. San Juan Basin data adapted from S.S. Papadopulos & Associates, Inc. (2006); Topper (2009); M. Fesmire, presentation to the committee, June 2, 2009; and D. Mankiewicz, presentation to the committee, June 2, 2009. Piceance Basin data adapted from S.S. Papadopulos & Associates, Inc. (2007), and Topper (2009). Uinta Basin data adapted from Rice and Nuccio (2000) and EPA (2004). FIGURE 2.8 Annual water and gas production curves for CBM activities in the Powder River, San Juan, Piceance, and Raton Basins. "bbl" = barrel. SOURCES: Powder River Basin, Wyoming, data adapted from wogcc.state.wy.us/ (accessed March 5, 2010); Powder River Basin, Montana, data adapted from Meredith et al. (2010); San Juan Basin, Colorado, data adapted from S.S. Papadopulos & Associates, Inc. (2006); Piceance Basin, Colorado, data adapted from S.S. Papadopulos & Associates, Inc. (2007); and Raton Basin, New Mexico data adapted from octane.nmt.edu/gotech/Main.aspx (accessed June 21, 2010).